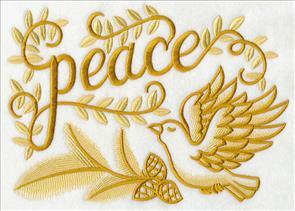 Bring a natural look to your gifts and decorations with these machine embroidery designs! Pine cones and branches add a wild and woodsy effect. Deck the halls and walls of your home with these new designs that showcase the raw elegance of the great outdoors. Animals with retro style and flair trim the trees in their forest home. 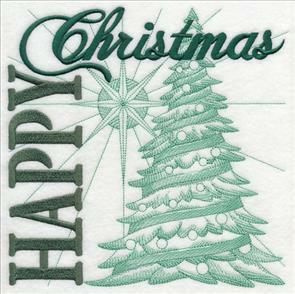 And, quick-to-stitch squares and festive greetings are fast, fun ways to dress up tea towels and table linens. Scroll down the page and walk through the woods! 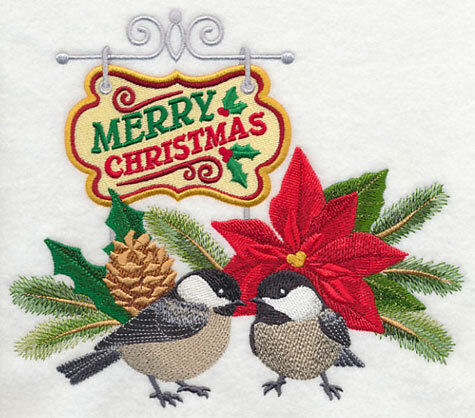 A pair of chickadees bring Christmas greetings to your holiday projects. 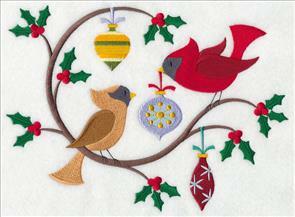 The sweet little birds are accompanied by pine branches and a bright red poinsettia. 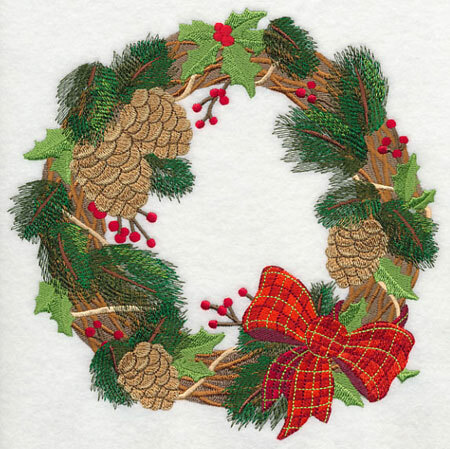 This design brings the beauty of a woodsy holiday to pillow covers and wall hangings. 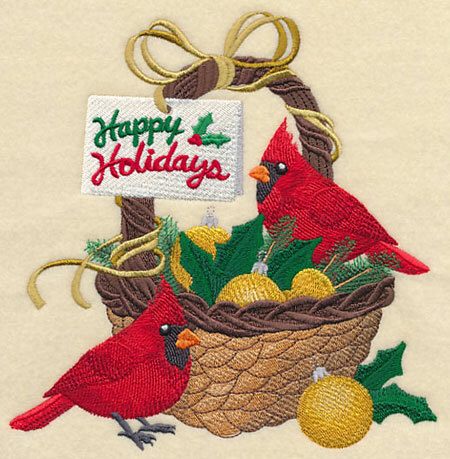 7.82" x 6.73" and 6.81" x 5.85" and 5.68" x 4.85"
Bright red cardinals perch in a basket of ornaments, accompanied by a card giving holiday greetings. A festive and colorful addition to Christmas decor! 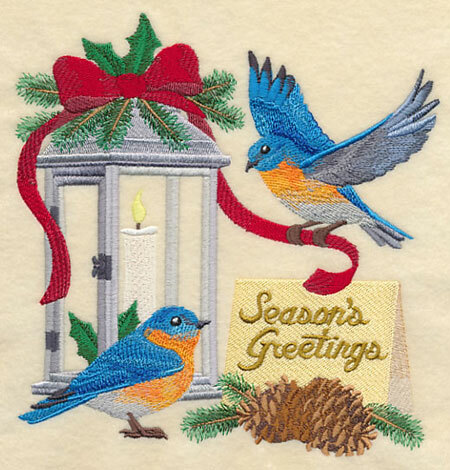 6.90" x 7.09" and 5.85" x 6.02" and 4.88" x 5.02"
Bluebirds decorate a lantern with red ribbon. 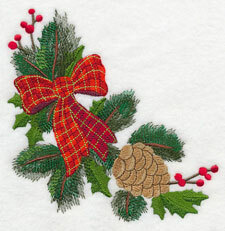 Sprigs of pine, and cones, add a woodsy note to this design. Lovely as a framed piece, and on pillows, too! 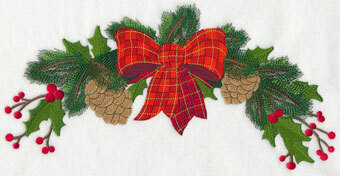 6.91" x 7.13" and 5.88" x 6.06" and 4.87" x 5.01"
Stitch a very merry woodsy Christmas with pine boughs, berries, and cones. The boughs are all wrapped up in a wreath, and sealed with a bow. 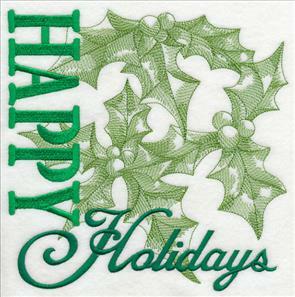 It's a colorful and charming addition to placemats, table runners, stockings, and cushion covers. 7.79" x 7.68" and 6.97" x 6.90" and 5.95" x 5.87" and 4.92" x 4.88"
Swags and sprays of pine boughs and cones are fashionable additions to holiday projects. They're magnificent on bath towels, and table linens, too. Add a cozy, woodsy note to your home decor this Christmas season with these designs. 6.92" x 9.54" and 5.65" x 7.80"
11.75" x 5.81" and 9.40" x 4.64"
7.80" x 3.84" and 6.85" x 3.37"
Coordinating corners and borders add the perfect touch to table linens. 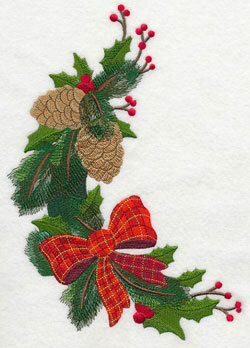 Add the border to a placemat or table runner, and tuck the corner onto a linen napkin. They're also festive additions to bath towel sets, too. 5.86" x 5.84" and 4.86" x 4.83"
11.75" x 4.03" and 9.41" x 3.23"
7.81" x 2.69" and 5.98" x 2.14"
by using the links above, or buy them in a design pack. Four sizes are available. Contents vary; click on a link below to see the designs included in each pack. **XL - 9 Designs smaller than 7" x 11.8"
**Lg - 9 Designs smaller than 6" x 10"
**Md - 8 Designs smaller than 7.9" x 7.9"
**Sm - 6 Designs smaller than 5" x 7"
Woodland critters deck their forest homes for the holidays! Busy squirrels and cardinals hang bulbs and ornaments from tree branches. They've got big personality and charm! 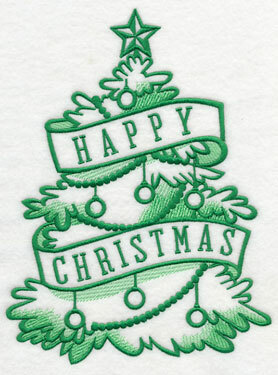 The designs were drawn in a retro style, making them simple and fashionable additions to Christmas decor. 9.39" x 6.91" and 7.83" x 5.76" and 6.59" x 4.85"
Cheery chickadees and festive rabbits add jingle bells, ornaments, and candy canes to their woodland homes. These designs are the perfect pairing of retro style and natural flair! 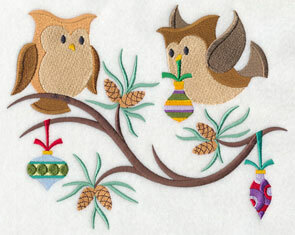 Brighten up stockings and tree skirts with these delightful motifs. 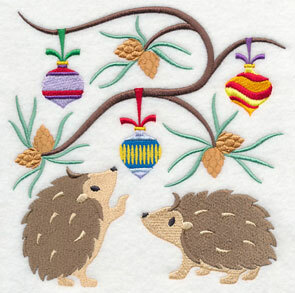 6.90" x 7.68" and 5.86" x 6.53" and 4.86" x 5.41"
Hedgehogs and owls are popular and top-trending subjects in many art styles - including embroidery. 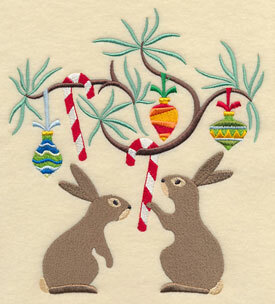 These woodland friends are decorating tree branches with brightly-colored ornaments. 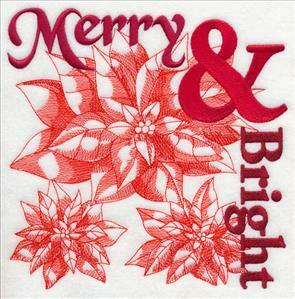 Festive and fun on bath towels, kitchen towels, stockings, and more! 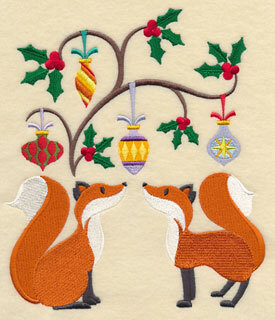 8.54" x 6.90" and 7.25" x 5.86" and 6.00" x 4.85"
Foxes and chipmunks spread Christmas cheer! Holly, mistletoe, and ornaments are colorful additions to their surroundings. 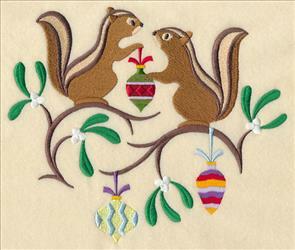 Embroider these designs onto stockings, tree skirts, quilts, and wall hangings. 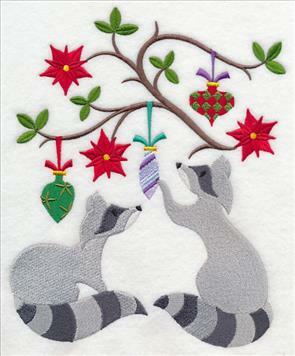 8.13" x 6.90" and 6.90" x 5.85" and 5.72" x 4.85"
A pair of raccoons hang ornaments from a tree, peppered with bright poinsettias. A lovely addition to placemats, wall hangings, and towels. 6.91" x 8.54" and 5.86" x 7.24" and 4.86" x 6.00"
These charming woodland creatures are ready to deck the halls for the holidays! They're sure to bring festive color and charm to your gifts and home decor. Order them individually by clicking the links above, or buy all nine in a pack! 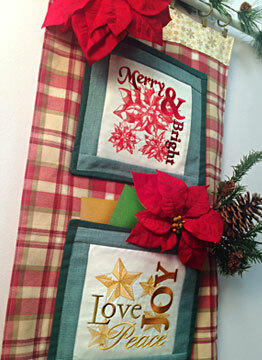 Light and lovely Christmas squares are fast and fashionable additions to holiday projects. 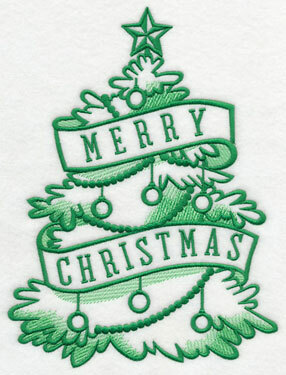 Classic words and Christmas greetings are paired with traditional images. 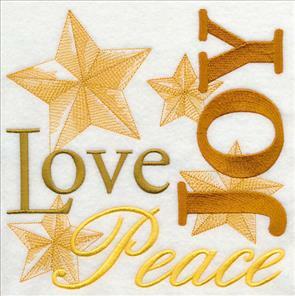 The text is bold, and the background elements are light. 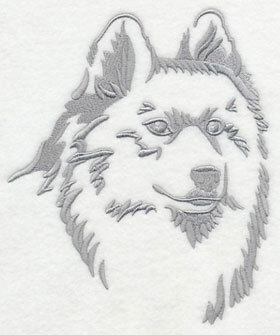 Embroider onto smooth, neutral fabrics for excellent results. 5.91" x 5.86" and 4.90" x 4.86"
7.80" x 7.72" and 6.98" x 6.91"
5.92" x 5.86" and 4.91" x 4.86"
Words of Love, Joy, and Peace are paired with light-and-breezy Christmas stars. 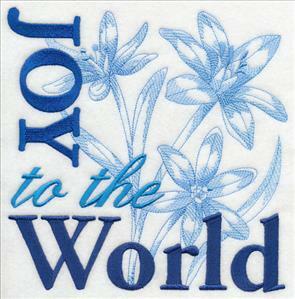 And, the phrase Joy to the World is accented by delicate flowers. 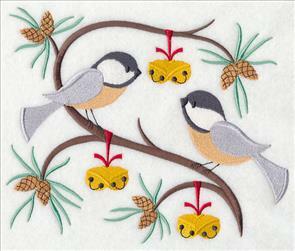 Beautiful on quilt blocks, table linens, apron fronts, and tea towels. 7.81" x 7.75" and 6.96" x 6.91"
7.80" x 7.75" and 6.94" x 6.90"
5.86" x 5.82" and 4.88" x 4.85"
Happy Holidays is paired with light-stitching holly springs, while the phrase Merry & Bright is accompanied by poinsettias. Beautiful on pillow covers, tea towels, and more! 5.84" x 5.84" and 4.86" x 4.85"
7.80" x 7.80" and 6.90" x 6.89"
5.85" x 5.84" and 4.85" x 4.84"
Add Christmas magic to your holiday decorations with this reindeer's flight! 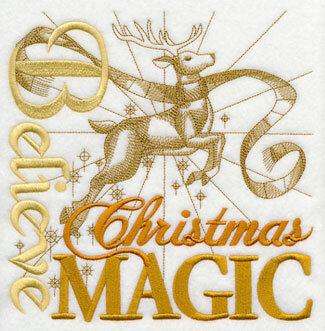 The words Believe, Christmas, and Magic are solid; the reindeer and stars are light and open. Beautiful on smooth neutral fabrics, such as quilter's cotton, linen, twill, duck cloth, and denim. 7.76" x 7.80" and 6.91" x 6.94" and 5.86" x 5.88" and 4.86" x 4.88" and 3.84" x 3.85"
Blackboard art gets a festive twist in these designs. Words and phrases are paired with energetic images. 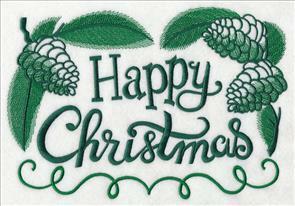 These designs are light and open, making them quick to stitch on tea towels, aprons, quilt blocks, and gift bags. 9.94" x 6.90" and 7.80" x 5.42" and 6.85" x 4.76"
Those of us in the United States are known to say "Merry Christmas," while our friends across the pond and Down Under tend to prefer "Happy Christmas." Both versions are available for your stitching pleasure. 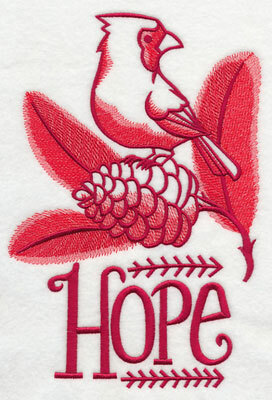 A Christmas cardinal perches on a pine cone, above the word Hope. 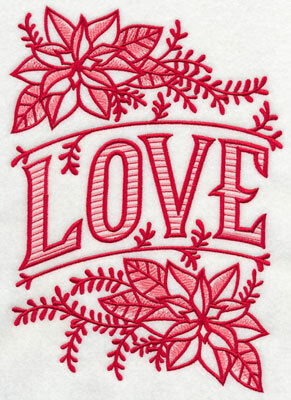 And, the word Love is flanked by festive poinsettias. These designs are light with open areas. They are beautiful additions to quilter's cotton, twill, linen, and other smooth, neutral fabrics. 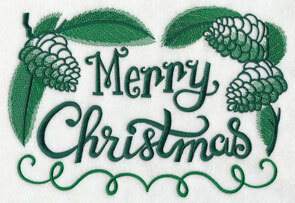 6.90" x 9.53" and 5.64" x 7.80" and 4.85" x 6.70"
Christmas greetings are surrounded by pine cones and graceful, energetic lines. 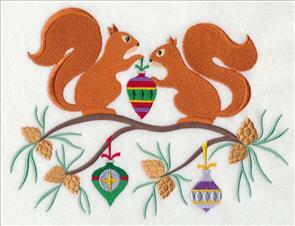 These designs are quick to stitch onto table linens, wall hangings, and quilts. They're light with open areas, and are beautifully paired with smooth neutral fabrics: quilter's cotton, twill, denim, duck cloth, canvas, crepe-backed satin, and suede. 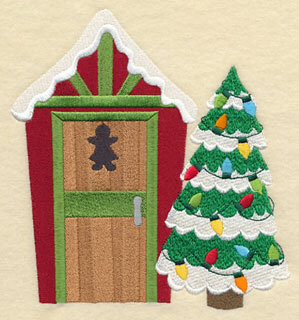 These designs, inspired by the popular blackboard art style, are festive and fast additions to Christmas projects. They're light with open areas, and are best paired with smooth, neutral fabrics. 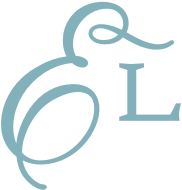 Examples are quilter's cotton, twill, linen, denim, duck cloth, canvas, crepe-backed satin, and suede. Order the designs individually by using the links above, or get them all in a design pack! 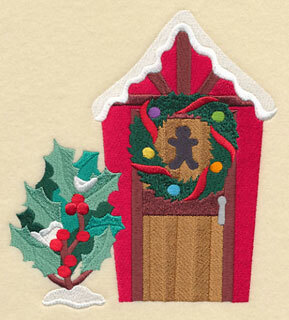 Add a fun and festive look to bath towels with these Christmas outhouses! Gingerbread cutouts in the doors represent the "his" and "hers." 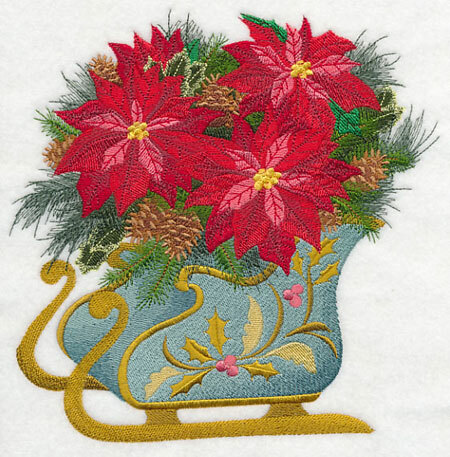 If you're new to embroidering on bath towels, there is a tutorial that will give you excellent guidance: This Fabrics 101 article for embroidering on towels. 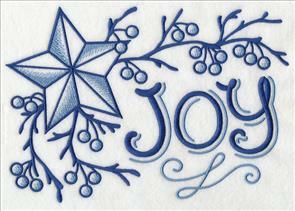 5.85" x 6.33" and 4.84" x 5.23" and 3.56" x 3.85"
Pair these two designs and stitch a beautiful Christmas scene! 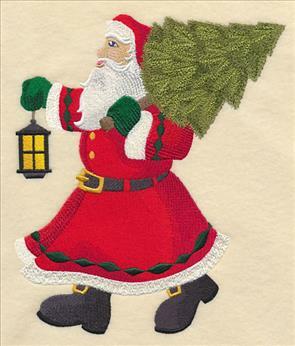 Santa brings home the tree, carrying an evergreen over his shoulder. He's followed by a reindeer, carrying tinsel, lights, and decorations. 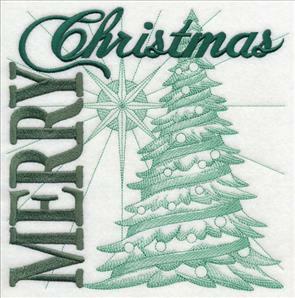 Embroider the two designs onto pairs of stockings, towels, and pillow covers. Or, stitch and frame, and hang together, for beautiful effect! 6.88" x 7.85" and 6.32" x 7.22"
5.09" x 8.49" and 4.68" x 7.80"
4.32" x 7.21" and 3.59" x 5.98"
An elegant sleigh is decorated with delicate holly, and filled with bright poinsettias and pine cones. 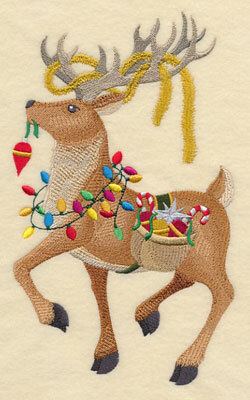 A beautiful addition to stockings, pillow covers, and wall hangings. 7.58" x 7.61" and 6.88" x 6.90" and 5.85" x 5.87" and 4.85" x 4.87"
June's best friends - Frosty and Sebastian - are Samoyed. Lynn writes that she and her husband became "parents" to a Samoyed as well. Connie has a several friends who have the breed. 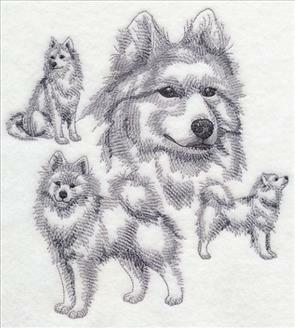 All of these women wrote in to request this beautiful breed in the sketch and silhouette style. They want to make special gifts that celebrate this fluffy, handsome creature. Thank you for the requests - we are happy to oblige! 5.86" x 7.02" and 4.86" x 5.82" and 3.23" x 3.87"